State Rep. and Colorado Attorney General candidate Joe Salazar (D) has HB18-1071 — which he’s dubbed the “Martinez/Earth Guardian” bill — scheduled to be heard in the Colorado House Health, Insurance & Environment Committee today. Here’s four things you need to know before today’s hearing. 1 –“Martinez/Earth Guardian” bill? Didn’t the Colorado Supreme Court announce this week they will review the Martinez appeals decision? That’s right, this week’s breaking news was that the Colorado Supreme Court announced it will review the Martinez appeals court decision. The ruling pertains to a lawsuit filed by teenage environmentalists who are backed by a number of national “ban fracking” groups. It would make proving that proposed development does not “adversely impact human health and does not contribute to climate change” a condition of the permitting process. The Colorado Oil and Gas Conservation Commission (COGCC), which regulates the industry in the state, voted unanimously to appeal the decision, and COGCC’s appeal was backed by current Attorney General Cynthia Coffman. It will now be reviewed by the Colorado Supreme Court. Essentially, Rep. Joe Salazar’s “Martinez/Earth Guardian” bill seeks to codify an appeals decision that hasn’t even been fully adjudicated yet and is set to be reviewed by the Colorado Supreme Court. The Martinez case, also known as the Our Children’s Trust case, playing out in Colorado’s state courts was put forth by national environmentalist groups — backed by wealthy funders like the Rockefeller Brothers Fund and the Leonardo DiCaprio Foundation— in hopes to curtail fossil fuel use and production. The group started its campaign several years ago in Oregon and has expanded its legal fights into eight separate states, including Maine, Massachusetts, North Carolina, New Mexico, Pennsylvania, Washington, and Colorado. It’s not surprising that Rep. Joe Salazar is lending a helping hand to these groups by bringing forth a bill like the “Martinez/Earth Guardian” bill, after all, Rep. Joe Salazar literally says out loud on the internet (the place where information lives forever) that he’s “working on such an amazing bill with Food and Water Watch,” another well-documented national anti-fossil fuel group. 3 – Questions Raised By… Martinez’s lawyer regarding the “Martinez/Earth Guardian” bill? This bill had a lot of social promotion from anti-fracking activists, encouraging activists to attend today’s hearing. 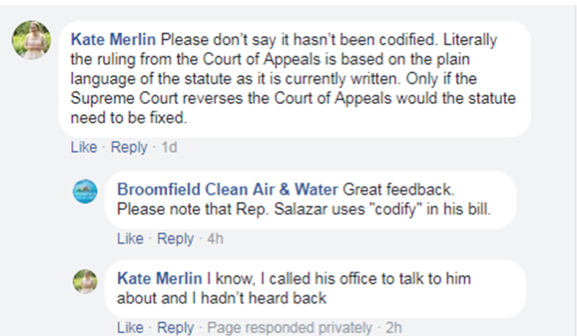 However, all the hype led to the below Facebook exchange between Kate Merlin, one of the attorney’s representing the children involved in the Martinez case, and anti-fracking group Broomfield Clean Air & Water, showing that Merlin finds Rep. Salazar’s HB18-1071 legislation is unnecessary now. The above realization by those in the anti-fracking camp, coupled with the Colorado Supreme Court’s announcement this week to review the Martinez appeal, will make for an interesting hearing today. Voices from across Colorado have warned about the costly impact the Martinez ruling could have on the state’s economy and the bad precedent it could set for other important industries in the state. As EID has previously noted, Colorado Petroleum Council Executive Director Tracee Bentley has warned of “major economic risks” the ruling carries for Colorado’s oil and gas industry – an industry that a recent report says provides Coloradans with 78,300 direct industry jobs, 83,500 service jobs, 22,600 wholesale and retail jobs, and 4,800 manufacturing jobs and nearly $23.1 billion in wages in 2015. The Martinez ruling isn’t good for Colorado and carries serious implications, which is why the Colorado Supreme Court announced this week it will review the Martinez appeals decision. Another thing that isn’t so great for Colorado is Rep. Salazar’s work-around bill, House Bill 18-1071. It will be interesting to see how this plays out today under the gold dome. Expect national ban-fracking groups to use the hearing as a way to generate headlines, but don’t expect the bill to get to far in the legislative process. Both Democrats and Republicans understand the implications of passing this latest ban-fracking bill.